Secretary of the treasury of Lithuania under King Sigismund I. of Poland; born in the middle of the fifteenth century; died at Brest-Litovsk, 1519. When Alexander Jagellon expelled the Jews from Lithuania in 1495 (from which banishment they returned in 1503), the most prominent Jews of the principality were the three brothers Jesofovich of Brest: Abraham, Michael, and Isaac. 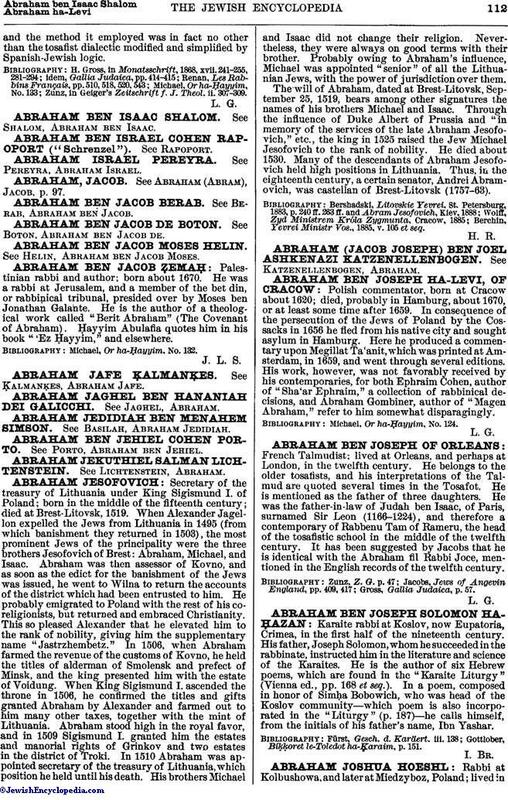 Abraham was then assessor of Kovno, and as soon as the edict for the banishment of the Jews was issued, he went to Wilna to return the accounts of the district which had been entrusted to him. He probably emigrated to Poland with the rest of his coreligionists, but returned and embraced Christianity. This so pleased Alexander that he elevated him to the rank of nobility, giving him the supplementary name "Jastrzhembetz." In 1506, when Abraham farmed the revenue of the customs of Kovno, he held the titles of alderman of Smolensk and prefect of Minsk, and the king presented him with the estate of Voidung. When King Sigismund I. ascended the throne in 1506, he confirmed the titles and gifts granted Abraham by Alexander and farmed out to him many other taxes, together with the mint of Lithuania. Abraham stood high in the royal favor, and in 1509 Sigismund I. granted him the estates and manorial rights of Grinkov and two estates in the district of Troki. In 1510 Abraham was appointed secretary of the treasury of Lithuania, which position he held until his death. His brothers Michael and Isaac did not change their religion. Nevertheless, they were always on good terms with their brother. Probably owing to Abraham's influence, Michael was appointed "senior" of all the Lithuanian Jews, with the power of jurisdiction over them. The will of Abraham, dated at Brest-Litovsk, September 25, 1519, bears among other signatures the names of his brothers Michael and Isaac. Through the influence of Duke Albert of Prussia and "in memory of the services of the late Abraham Jesofovich," etc., the king in 1525 raised the Jew Michael Jesofovich to the rank of nobility. He died about 1530. Many of the descendants of Abraham Jesofovich held high positions in Lithuania. Thus, in the eighteenth century, a certain senator, Andrei Abramovich, was castellan of Brest-Litovsk (1757-63). Berchin, Yevrei Ministr Vos., 1885, v. 105 et seq.